This is the next best thing to spreading the paper out and reading it. While the Dallas Morning News is my local newspaper for North Texas, I read the Washington post cover to cover first. I also subscribe to the New York Times, primarily for additional Opinion perspectives. While this “information and perspective” triple decker sandwich Is both informative and enlightening, the ingredient that provides the definition is the Washington Post. Great design for those of us who love the print edition BUT takes forever to load/populate so extremely frustrating to use ... wasted opportunity with a strong idea foiled by weak execution. Call me old-fashioned, but I really enjoy seeing the print version of a newspaper. The Washington Post app allows you to see the print version and scroll through the pages on your tablet or phone. There are so many articles that I would not read if I were just scrolling through an electronic app. I know this for a fact. I read many more tidbits of interesting information when I am looking at the print version. Get this app. Subscribe to the Washington Post electronic version. I depend on the Post, the indispensable source. I use PressReader for the Post. Both this and PressReader have a similar reading experience however, PressReader moves you back and forth between the article origin and end then back again, as well as text mode, much easier than does this app. I’ll be sticking with PressReader. A good reason to dump Amazon and Whole Foods from my life. Print version just is what I find easiest to use. I’m in my 70’s. I’m used to a paper. The regular electronic version at times is confusing. This “print version” is easy for me to use is just what I need. Thanks. Great user interface, using classic newspaper layout. But I keep getting logged out and the app times out when attempting— repeatedly—to log in. I’ve missed multiple days of my subscription due to this lousy app service. This shouldn’t be happening in these days of app development with a national brand like the Washington Post. Digital version almost as good as paper. I like keeping up with my fav paper out of town! Much better than the NYT digital version. Works well, and easy to read specific article by tapping on initial portion. I like it because it’s laid out like the actual newspaper. I would prefer the real print newspaper if I was living in that part of the country, would probably award five stars if I had a bigger iPad! Update: This is still a fantastic iPhone app. I love the print edition replication. It’s also great on the iPad. April 2018: I read the NYT, WSJ, and WaPo. This is by far the best iPhone app of the three. I love everything about it and the content is superb. Bugs get repaired within a week of discovery. Bravo. I wish reading offline worked better for images. And very savvy digital presence. Love having it at my fingertips throughout the day. I use this app to read the paper when I’m out of network range. Latest update wants me to sign in, which is impossible out on the farm. Nullifies the purpose of the app. I use this app when I don't have service or to catch articles that are not in the digital version. With the latest update the print version does not work with no or limited service because it is always checking your subscription. Seriously flawed. Even with good cell or wifi service I have to enter my credentials almost every day. Why do I have to login every time I open the app and try to read an article? They said it was fixed, but now it just spins after I try to login. Are you trying to get me to switch papers, as it’s working? Love having the paper at my fingertips. Scrolling the articles is made easy by their function of being able to convert it from newspaper size to a scrolling article. Only negative is the difficulty is getting the crossword puzzle to be usable often, it freezes in the conversion mode and often freezes when doing it on line. I prefer to not print it out everyday, defeats the purpose of being digital. Also it would be nice if sudoku and scrabble were able to be done on line and they can even be printed at this time. I’m a subscriber charged automatically every month. Now app keeps telling me I don’t have a subscription and need to sign up. Finally gave up and cancelled subscription today. On page 4 even though I'm sign in keeps showing subscription page and won't show me the page. App needs major update! It can make you day somewhat better!!!!! Always worked before although I used to have to login regularly. Now I am logged in but can’t read the paper- it just tells me I need to subscribe even though I already paid. The font is too small to enjoy the paper. Will you permit user to adjust the print size please? App updated yesterday for “easier logon”. Today, it won’t let me access the online paper. Reached out twice to WaPo for help ... still waiting. No need to change this ever. Maybe the NYT will someday be capable, but no sign of that so far. App normally runs great. Only complaint is that recently the font size won’t change. Deleted the app, redownloaded, and still won’t work. ....it’s too sensitive. When I zoom in and swipe around the article, it opens the web edition (or it flips to next page)! Otherwise, I love having the paper anywhere I am. I am trying to move into the digital age. Slowly but surely, I am getting to like this new method of reading the Post. This is the second time in less than a week that I clicked on and article and got a pop up telling me to subscribe. In settings, I am clearly logged in with my account, but now I have to go through the extra step of putting in my email, password. Please fix this! I’m a WAPO subscriber and love being able to access the paper online when I am unable to get the print edition. I like that the format is exactly the same as the print edition, and not a “mobile” version of the newspaper. The app works very well. Font size adjustment was broken in a recent update. Everything is displayed at aim a huge typeface that can’t be changed. It’s so annoying I stopped using the app. Why the h*** did your update log me out! I’ve been using this app for several years, and I love it. There is however, one improvement that I would like to see. The local and real estate editions are only for the DC metropolitan area. I would like to have the ability to select my home region - Northern Virginia. This should be a simple thing to add to the settings menu. If this is done, I will enthusiastically give it a five star rating. Please consider making this improvement! I was reading my first article, and saw that they have a banner ad at the bottom that blocks part of the page, and flashes intermittently, and says “Thank you for choosing the Washington Post.” Does this ever go away? Why would a reader want to see this? Thank you for making a great app in this format, it’s a very good user-friendly app for reading the daily and Sunday newspaper. After the update in early June, we could no longer open the WP Print Edition on our iPad. It still opens on our iPhones but not on the iPad. We have requested the issue be fixed via email but to no avail. We just want the print edition on the larger screen. Otherwise, the WP is our “go to” source for news. Too liberal. Every almost every article is anti Trump. Constant hassle. Cancel my subscription at the end of the month. This is a constantly crashing app. Every day the same problems. Slow to load, unstable, crashes. Fed up. Sept 23, 2015......FIX IT. Crashes when trying to load print edition. Nov. 13, 2015 New update. Need adjustments. Lacks links and flipping to next page doesn't always work. Why not just leave a working release alone? July 4, 2017 Broken again. Fix it and then leave it the hell alone. June 2. Broken again. Fix it and then fire your IT staff. First rate, essential and exceptional. If it matters to Oregonians, it’s in the Washington Post. Lately, this app no longer downloads new content for me. Customer support initially suggests reinstalling the app, which didn’t work. The very next email reads “there is nothing further we can do”. I love the print edition. However, it would improve the experience if there were active links to the second pages of articles. I mainly use this version of WP to read the comics, and it's very slow and clunky. Disappointing. Update 5/26/18: deleted app and reinstalled (have done this several times). Now seems to be working well. I updated on May 24. Now I t consistently crashes every time I try to use it. So now I have to give it the lowest possible rating. I didn’t realize how much I would enjoy reading the paper on my iPad!! It takes the Post to a new level. I can read this like I did the old print version! After doing it 40 Year’s that way it’s what I prefer. Thanks! The New York Times ought to learn from you. I mainly use this version of WP to read the comics, and it's very slow and clunky. Disappointing. Every time I try to open the app, it immediately closes. I tried restarting the iPad, but that doesn’t change anything. UPDATE: app developers suggested I delete, then re-install, the app. That cured the issue, so I’m giving the app its 5 stars. This is one of the worlds best newspapers and I’m glad that they have a way of letting me read it in a format that is, in some ways, better than reading the actual paper. Are there some glitches, yes. But on the whole, it’s an experience that I look forward to every day. They have fixed some of the more irritating problems and I now find it working well. The e-edition is too sensitive to the touch and will flip pages when attempting to manipulate the size and view on a specific page. I read the NYT, WSJ, and WaPo. This is by far the best iPhone app of the three. I love everything about it and the content is superb. Not withstanding the critics who lambast the Post, I find this a very reliable source of #realnews. This is very important with propaganda news from Russian operatives and homegrown conspirators. Everyone makes occasional misstatements but the Post tries hard, I believe, for honest news. Thank goodness for the Washington Post. Freedom of speech and the press is the single most important element of our country’s version of democracy, and the Post is at the center of the bulwark against those who would diminish or stymie our constitutional rights. With intelligent, courageous and interesting writing, the Post does the First Amendment proud. Can’t open this app anymore. Every time I try to open an article to read it, the app freezes. I then have to force close the app and restart it. This has been going on for quite some time and numerous updates. Enough already! Just fix it. First-class app. Love being able to see the pages; high fidelity and functionality: great page and newspaper-section navigation, turning, story call-up and bookmarking. I’m a writer and research nerd who would like two functional mods: For citation and sharing purposes, include the full Web addresses rather than tiny URLs whose validity in future is uncertain. Allow me to save full text of a story to my email program for indexing and later offline reference. Perhaps this function could be made available to paid subscribers? Still, a smooth and excellent app. The new update is horrible. It freezes up on my iPad every time I open an article. Thank God for The Washington Post! While I enjoy the technical aspects of the internet delivered Post, it’s the great writing and color photography that I appreciate most. Coverage of the U.S. Government and international events are what I think are most valuable to me. An example is the story today about the people in South Korea who were floating water bottles filled with rice, medicine and information into North Korea. Thank you for the light you shine on the parts of our world that are difficult to see and understand. I like this app much better than the other two Washington Post apps. I think the app would be even better if the following improvements are made: - Do not zoom out easily. When I read articles on my iPad, I usually zoom in to show only two columns in portrait mode. However, the app zooms out to show whole page when I tap somewhere or when I come back to the app after using other apps. I wish the app did not automatically zoom out. - Do not jump to non-print edition of articles easily. I like this app because I like print edition, obviously, but app takes me to non-print edition when I tap text. I wish the link to the non-print edition was embedded only in, e.g., the title of the article. - Do not a flip page easily. When I zoom in to show only two columns and swipe to show the next two columns, the app sometimes flip the page. I would like to flip a page only when I swipe near the right end of the page. - Add capability to use dictionary. I sometimes want to use a dictionary while reading articles, so it would be helpful if I could select a word to use a dictionary, like we can in, e.g., the Safari app. Some taps in Sports don’t take you to the article. Otherwise a brilliant innovation. Support the free press. Keep the light shining. This subscription is perfect. It allows Me to read real news in depth. It provides links to support the articles I’m reading. I can do all of this from the comfort of my chair with a cup of coffee, a glass of wine, or anywhere else I may happen to be with my iPad. Getting it delivered digitally saves the trees. Support your local press and keep the light shining. No only is the Post a terrific paper with a great group of journalists, the print edition is a great way to read the paper. I have been a reader of the Washington Post for over 40 years. This is unquestionably one of the most comprehensive newspapers in the country. I feel confident that, after reading the in-depth reporting and the news analyses each day, I have a very good understanding of what is really going on in the world. Great app for reading the news on the iPad. I wish NYT had something like this as well. My only gripe about the app is the location of the advertisement at the bottom of the articles. I find it distracting and prefer the way NYT does it in their app. In the latter case it feels just like the ads you see in an actual newspaper. The adds in this app feel more like something from a cheap website. The developers need to take the time an read entire issue as if it were a physical paper and not open the articles to read. I use the smaller iPad and read the articles as if I am reading the paper (I am 50 it’s habit) the seemingly random changes in zoom and page turns are incredibly frustrating. The feature that allows one to select and focus on a single article in the print edition should be enable for editorial cartoons and the comics page. I like the print version because it’s a good transition for me from paper to iPad. The only gripe I have is the turning the pages is a bit awkward. With the real newspaper you can leaf through them quickly. Here it is a bit more cumbersome and takes a little bit longer. I like seeing the full article on each page and by tapping I get the whole text which is better than having to leaf through to the continuation on another page. I grew up with the Washington Post , and this delivers everything you’ve come to expect with the print edition. Ability to manage font settings is a big plus, tho little to most I can read it during early hours. Auto delivered, it keeps you in the know of the news as it occurs. This was a great app and I loved reading it on my iPad Pro. It no longer loads and refuses to let you go to back issues. I currently subscribe to WP paper version. In the past, I’ve subscribed to several magazines and newspapers online. The ease of access on this one is the best I’ve seen. It is easy to preview the print edition, then click or double click to read an article either mirroring the print or mirroring the online version. I’m glad a newspaper finally got this right! The best way to remove the digital silos that have been following us from the 90’s. Gives the whole paper, as if printed, but with the convenience of digital. You can follow a story on the ‘paper’ or click into it for easier reading. Love this app which helps me enjoy Post on the road while my family keeps the print edition. Great paper, more important now than ever!!! This app gives me the best of both worlds - I can turn the pages of the actual newspaper layout, And I can also triple tap on the article and read an enhanced digital version. WAPO also offers another app that updates the paper in real time. Well done! It always takes too long to connect on my iPad and “times out” before I ever get anything. App doesn’t load the newspaper! Love the feel of a real newspaper on my iPad, plus the reporting continues to ROCK! It’s OK but things in Washington? Things in Washington ain’t all that great. Over saturated with Trump... will eventually make us all numb to decency and truth. If they could filter out all Trump stories, there would be little left to read... WaPo should have an edition For non-political people like me. I appreciate seeing the traditional look, seeing the entire front page. I strongly dislike the abbreviated app style where only three stories are visible. Just curious when opening up my app, that I find a old fashioned alarm clock symbol to the top right of the WP. Any answers would be appreciated I am giving a 4Star rating because the journalism is top shelf, the screen acts funky at times when I’m trying to resize. The New York Times print edition loads in a heartbeat. The Post takes a minute or more. Irritating. You can read every page. Outstanding interface. Not surprising that Bezos the Post owner has great technical talent employees to do this. Should be 5 stars. I can read the printed, historic, delivered paper on my phone. No one else does this. I will swallow the bias just for the beautiful print copy. I’m hooked! The print edition takes 5 minutes to begin to load and 10 more to finish. This is new. Not worth the effort if this continues. I enjoy the digital print edition. Just like reading and navigating print but easier! I also like the fact that I can send articles to friends and family. I love this style that looks just like the paper edition. I like how you can tap to go to the article in a larger, more readable format. The ability to send articles to friends is a big plus. I usually read Style and Metro sections, look at the front page, get angry because they just want to trash the president, then close it. Except for Tuesdays when the Health & Science appears and, of course, the Weekend paper has news other than politics. I love the print edition. Unfortunately the recent updates are making the app more and more frustrating to use. First, the app frequently dumps editions, even on the same day. I assume the app is designed to conserve memory, but it is too aggressive. I would prefer an option to force the app to keep some number of days (0-3?). Also, when navigating, the app sometimes seems to hesitate. It will take 2-5 seconds to open an article. Finally, it it not unusual for the entire app to freeze. Here’s hoping for a quick update! The Washington Post is simply great journalism and writing. I find it very difficult compared to accessing the NYT online edition. Always go to the Times. Rarely to WAPO online. Since I downloaded the update yesterday, it crashes Every time I try to turn the page. Impossible to read it this morning. 10/21/15. This is the second time in three days that I have had to delete the app because when going onto the continuation of an article, I could not get back to the paper. 12/4/15. Still freezes every day. Have reported this numerous times. Still freezing 6/10/16. Much improved app. No more freezes. Most problems fixed. Love it. The Post has worked hard on perfecting this app. Can't wait to read it every day. After zooming in on an article in print edition, when you touch the screen to move the page it zooms out and you have to zoom back in again to see it. Two annoyances: If you zoom in on a portion of a page and then attempt to move left or right it turns the page. Touch a little too hard and it is opening the article rarely do I want to do this I would welcome a “do you want to open” dialog. I’ve been using the app for years and it’s always been a fantastic substitute for the paper, er, paper. Over the last month, however, the app sometimes interprets a single finger moved across the screen to follow an article as a combination pinch to zoom out and swipe to turn the page. Any chance we can make a tweak to work out these wires that were recently crossed? Love the upgrade! Love the paper. This Is my third year reading the print edition. I count on it. Ill be back again this year for sure. Print edition is much improved after the latest update. Fast loading pages, smooth page turning, and option to not download sections that you don't usually read. Great job WP! Update 4/30/16: page sections or entire page blacks out frequently when page is expanded to enlarge the type for reading. This happens about every other page. The only way to read the blacked out page is to pinch down to initial type size, swipe to go to next page, swipe back bad then the original page can be read without blacking out. Update 2: moving around expanded page using finger swipes and gestures has gotten worse especially when using one finger to move around an expanded page. Sometimes it works and other times it closes the page or goes to next page. Then you have to reopen the page or page back. Very irritating. After the last update, the sensitivity and responsiveness of the app to swipes has made the app very frustrating to use. You used to be able to slide the displayed page over to read the next column but that now results in the page turning or zooming back out. Very frustrating and needs to be fixed. I use this on my iPad when away from home and my print edition. I like that older copies of the print edition are available here too! Outstanding digital rendition of the paper! Love the portability of the paper during morning commute on train and having previous issues at my fingertips. This causes pages to zoom out and turn when I’m simply trying to pan the page. Worked better before this recent (2-3 weeks?) change. Other aspects are good, such as content and loading time. I travel constantly, but no matter where I am, I can have a cup of coffee (or scotch depending on where I am in the world) and read the post on my iPad. I love that it’s the whole paper, ads and all. To me it’s important to see all those little stories that might become a big story. The read the New York Times and Wall Street Journal as well; the Post app is hand down the best. Too bad you can't use the app to line your birdcage. The content is a bunch of liberal drivel and talking points. Sometimes the app works. Not sure why but NY times downloads much faster than Washington Post. I wish it could be a faster download. Tell Jeff if he had the balls and we know he doesn’t, he’d run for president and not use his paper to trash Mr Trump. The Post has always been to the left, but seriously. Unlike the NYT, the app shows the whole paper. You’re able to scroll through and not miss anything, but without newsprint or delivery hassles. Wish other papers would use the same model. This app quit working sometime around October 2017, rendering my subscription unavailable and therefore worthless, so I cancelled. I just checked reviews by recency and the positive reviews are still lacking. I'm sticking with the digital edition (inadequate though it may be) and going to NYT e-print. This is ridiculous. I love the ease of how the pgs flip an I’m able to flip back n forth. An online paper that got it right! I love the print addition of the WAPO. It’s like reading and browsing a regular paper on my iPad. I can see a whole page virtually at a glance, expand any article I want to read or if the article continues on another page, tap the title and the full uninterrupted article pops up. When I’ve finished the article I can easily return to the page I’ve left. I have online subscriptions to 2 other papers, nether of which are as user friendly, intuitive nor interesting to browse through. Thanks for a great morning read! Please always keep the presses running. What a great layout. Click on an article and it’s opened in a reader. Thanks. This is an excellent replacement for a real paper in your hands, which is what I tend to like. I now like this virtual paper more than a real, physical paper. Navigation is easy, and turning the page is as though you have an actual paper in your hands. Great technology, guys! I'm using this on an iPad mini and have no technical issues. Having been a Post junkie from a very young age I am thrilled to carry the print edition with me on my phone. I can almost hear the pages turning. On paper or online, it’s still “fake news”. I just read the sports page. Pages reload multiple times so it's impossible to finish an article, and app crashes often. On IOS 9, but you need to keep apps backward compatible or say you no longer support it. Cancelling subscription. Perfect reader a world where news readers like google news have become completely worthless. You can browse like a real paper, then zoom in to the full article formatted for the web with a single click. No worthless giant pictures, lots of real content. I understand the stories they choose to print, they feel relevant to me, and they are presented with an intelligent style. I prefer the digital replica version because where each article is placed on the page matters. I have been a reader of the post for some time and I tend to prefer the static layout of a real printed page over dynamic forms. This does it well and appears to be superior to the android version. Very smooth scrolling and scaling. The only nit is that dynamic stories have ads at the bottom that cover part of the page - even with a subscription. Of course, the best part of it is the journalism... democracy dies in darkness ...indeed. That’s my opinion of the Washington Post never afraid to print the truth. Love the wapo app. Just like reading the newspaper. possibly should only be docking this app only one star (or at most two) but the “My Post” section for saved stories is infuriatingly unreliable!! ... this app is for you. It loads quickly and provides each page laid out as if in print. It’s easy to navigate within and through pages. Best newspaper app ever! It is simply great to have the entire paper available wherever in the world I wander. I have a monthly subscription purchased through iTunes. The new update broke my login and I can’t seem to figure out a way to get it back. This is unacceptable. I have been a WP subscriber for years. Please fix or I end my subscription. Thank you for keeping Democracy alive by seeking the truth. App is generally good, but on iPad, often the link to send an article, save an article, print an article, etc, does not work. Wish the Post was not so politically biased. Now, I only read, if I read it at all, the Health and Local sections. I no longer feel that I can trust the Post’s reporting. The Post needs to publish less opinion and more news. 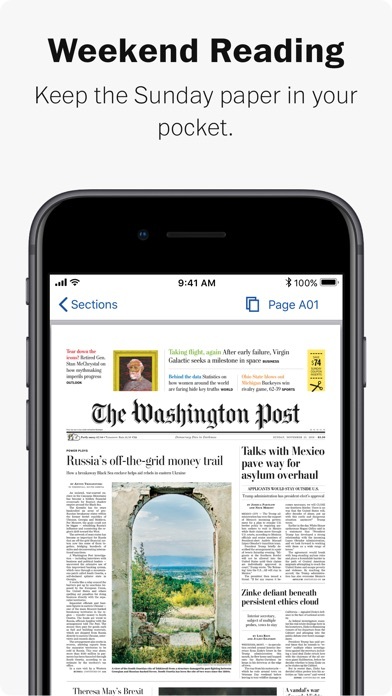 WAPO makes it easy to enjoy reading the news with this app. I am going to cancel my subscription. Every time I try to read the paper a big ad comes up asking me to subscribe. I am a subscriber and I can’t read the paper. What good is it? I am pleased to be able to read The Washington Post while traveling. I find it easier to read an browse when the paper is laid out like a newspaper. Thanks for making it easy for me. After a number of iterations the app was working pretty well but on a recent update it now seems to redownload a lot. If I download the paper in the morning and go back later in the day it now does another download. I don't have fast broadband (I live in the country) so this is a real hassle. Works fantastic, except it re-downloads the entire paper after I move locations. All the benefits of a real newspaper without the paper. Have been reading WP since moving to northern Virginia in the early 80's. Clear ,concise, interesting reading is what I found it to be. Their delivery service was top notch and now that I am living in rural South Carolina, it is my lifeline to he rest of the world. Thank goodness for digital. Paid $145 for subscription that I can't read. Native Washingtonian. No longer live in paper distribution zone so I have to go with the digital format. This app is denying me my ability to read the paper in my iPad Pro. So now I have to use the website. Seriously get it together WaPo..
We get the paper at home but i usually use the app to get the e-replica version. Easy to download when traveling. Great reporting! Why even bother offering print edition!? The only thing I would like to have is the ability to print the puzzles! The fact that I can read a “print edition” from anywhere in the world at anytime is just amazing. Sharper photos and text, easier to transport than paper. No good for wrapping the fish scraps. We cancelled the regular delivery of the paper version. Wish it would allow turning the page even when zoomed in on an article - you have to get a page back to its default size before turning to the next page. Can nag about some of the settings even if you have answered the question several times. I really like the full page version of the WP. I prefer seeing all the news, not just selections from it. Also, I enjoy the updated news that’s posted throughout the day. The subscriber is deceased and it is impossible to cancel his subscription to the digital/print edition I can’t even easily put in the nickname required! I just switched to digital from delivery for environmental reasons, but am disappointed that I now get the District edition of the Living section. No crime reports or real estate for my area. Please change this. Print edition is much improved after the latest update. Fast loading pages, smooth page turning, and option to not download sections that you don't usually read. Great job WP! Update 4/30/16: page sections or entire page blacks out frequently when page is expanded to enlarge the type for reading. This happens about every other page. The only way to read the blacked out page is to pinch down to initial type size, swipe to go to next page, swipe back bad then the original page can be read without blacking out. Update 2: moving around expanded page using finger swipes and gestures has gotten worse especially when using one finger to move around an expanded page. Sometimes it works and other times it closes the page or goes to next page. Then you have to reopen the page or page back. Very irritating. Update 3: after more than a year the developers finally fixed the app so that you can use just one finger to move around the page without weird things happening. Thank goodness that was fixed! Very slow to upload and very often have to download the same issue more than once. Does not keep track of last page viewed. After zooming into a page, when you try to move the page it will instead turn to the next page. Why is it so hard to flip pages? Looks and acts like the print edition at first. But once the reader enlarges the page to read the tiny type page flips just bounce against the edge. Oh you mean I have to carefully reduce the page back to its original display size before I can move on? But not too far or you are returned to the front section choice. This annoying behavior only gets more so. Update: still does this a year later. And half the glowing reviews refer to erratic page turning behavior. It’s apparent you really are not listening to this feedback. I have three version of Washington Post digital and this is my favorite. Just like a real paper. Gives the sense of the Front Page, with the Editor’s view on importance of articles that you don’t get with other digital editions. Nicely done! I love the luxury of being able to have access to the paper and/or the electronic copy anywhere we are. Only way for your subscriber status to be recognized is to delete app and download it again - on a daily basis. What fun! All newspapers (New York Times especially) should copy this format. Its the gold standard for newspaper apps. I grew up with the Washington Post , and this delivers everything you’ve come to expect with the print edition. Ability to manage font settings is a big plus. I can read it without glasses. Auto delivered, it keeps you in the know of the news as it occurs. When we first started taking the Post via Amazon, it was the national edition only. After a year or longer, both editions were made available. We lived in DC area two times and were so pleased to have access to the print edition via our Amazon account. Thank you. I cannot believe anything i read in this paper. Reporters think they are opinion writers. Looks and acts like the print edition at first. But once the reader enlarges the page to read the tiny type page flips just bounce against the edge. Oh you mean I have to carefully reduce the page back to its original display size before I can move on? But not too far or you are returned to the front section choice. This annoying behavior only gets more so. Whether you like the content or not, the Post is the best enewspaper. 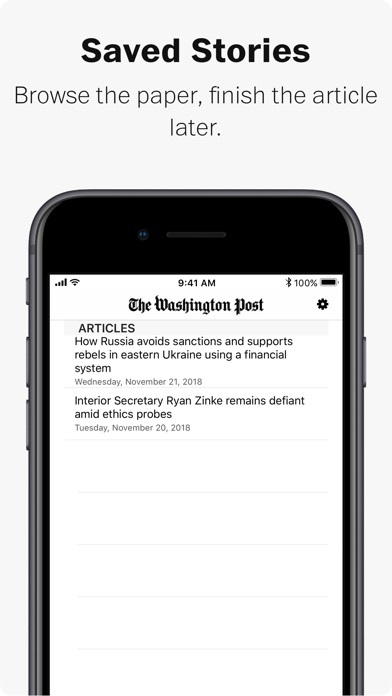 It gives you an authentic page turning experience of each edition (a feature sorely missed in WSJ and NYT), ease in reading articles as if in print by enlarging on screen or opening, and my favorite +++ the ability to easily share links (via text, email, or social media) that give others the ability to read the full article. This last one seems a no brainer function (but is annoyingly unavailable on USATODAY) that lets me share noteworthy articles with friends and colleagues for discussion and information. We need the Post to shine the light on what is happening. Once again the Post and the NYT are playing a pivotal role in our country. Please keep up your efforts and know that so many of us support and appreciate what you do! Apple pay portal says I'm paid through Nov 12, but upon login after update, WaPo says I have no subscription and demands I pay an additional $15.99 to open the paper. Um, no. Customer service? HAHAHAHAHA. What a marvel! As good as holding the paper in your hands and as navigable without losing your page or place. The ability to enlarge print and pictures in stunning color adds to my daily guilty-pleasure, morning ritual. Great job WP!! Ever since the last update to this app, it loses (“forgets”) its download on my iPad mini 2. The last 2 days, I have successfully downloaded the paper at home using WiFi and read it in the morning on the train without internet access. But when I try to read it in the evening, without internet access, it tries to download the paper again and obviously can’t and just gives a message that says “No Internet Connection.” This has never been an issue before. Please fix this ASAP. It’s frustrating. Love the print edition layout, but download is always a big problem. It is great to be able to have the whole Post when I am away from home. I can read every article on every page in the same order I prefer with the hard copy. This is a wonderful bonus to my daily and Sunday subscription. Thank you so much! 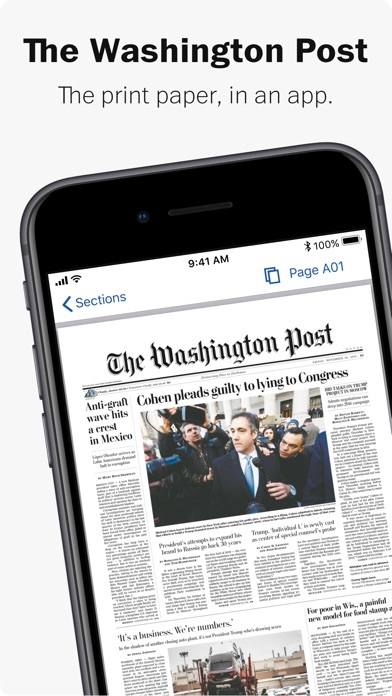 Make the Washington Post online as easy to read as the Pittsburgh Post-Gazette. 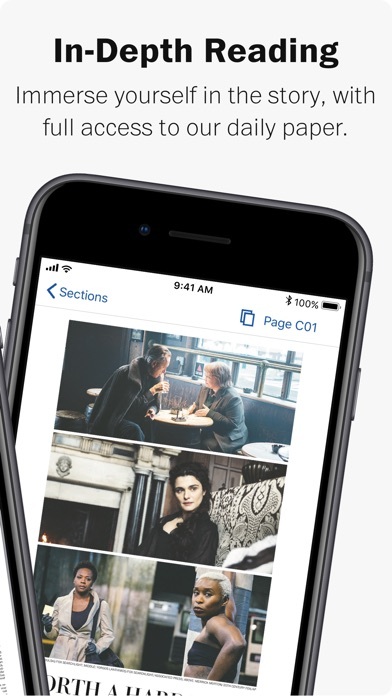 This app is nicely laid out just like you're reading the actual newspaper, but it's often unstable after you zoom in on an area of the page causing the pages to frustratingly crash, requiring you to relocate your spot again. I have been reading the Post since I delivered the paper in my neighborhood back in 1962-65. I enjoy the international news as well as national. The hometown news keeps me up on what’s going on in Virginia. I moved to Colorado 5 years ago and still have my Washington Post via internet. A very well organized app for getting national news! The Post covers politics like no other paper. They go beyond the horse race and provide deep analysis of the issues confronting our nation. I also like that the post gives me the option of viewing stories as a news feed, or I can read an online version of the paper. Best feature: immediate coverage of breaking political news through their notifications. Stability while reading an article is always an issue. Articles disappear without warning. I like the ability to read issues over a two week period. Newsprint does not get on your hands or clothing. Frequently articles come with additional pictures not available in the home print edition. As a paid subscriber to the WP, I resent be subjected to Google ads when I read the WP print edition on my iPad, and will cease doing so. WP should prevent this. I love being able to read the print layout, and the app works very well. Two issues: 1. After following a page link in the print layout, we need a quick way to go back to the original page. Easy fix: make the "continued from page A1" text a link that brings us back to the originating page. Other obvious solution: add a 'back' button in the top left, and put the 'sections' link in the top middle. 2. Opening the app in the morning it takes over half a minute to even show the cover images of the sections. It should be possible to at least feed four jpegs in a tenth of a second while we wait for the section download to complete And a last request: please offer a setting to show all photos in full color in the print layout. I would enjoy a splash of color, and I assume the original images are available in color. Other than that, great app! Very good app, would wish if the comics were not in such small format as wish they can be enlarged like the lettering. With the exception of some maneuvering issues, I like this method. However, having both print and facsimile apps is, I find the best way to get all I want from the paper. I occasionally want to email an article that I’ve opened (opened by tapping on the text of the article). The icon at the top of the page works only half the time - sometimes it responds and will email the article, sometimes pressing that icon does nothing. I’m on an iPad. Outstanding presentation ... the best of all worlds! I love being able to flip though the paper just like a print edition (which I missed terribly with all the digital formats out there that never present the paper correctly). This is pure genius. Some may think it’s a throw back to the scanning days of old but, rather, it’s a fresh take on the way papers are written and the way editors want them read. Bravo! As you might expect, having the news available in the full, traditional format gives me a better way to select what I want to read. I am so pleased with the quality of reporting and commentary. So much better than nytimes app. My only real criticism is the variability of download speed. I have a high speed Fios connection, and most times the download takes only 30 seconds for all sections. Sometimes, though, for no obvious reason, the download is as slow as molasses. If I leave the app open in the dock, the new issue ought to be ready to read as soon as I open the app, as it should be pre-cached. I wish the WSJ and the NY Times had the same digital presentation. The app works nicely and makes reading the pro-government propaganda quite easy. The problem, of course, is the warfare, welfare, crony capitalist loving editorial staff employed by this morally bankrupt company. The staff appear to be completely ignorant of even the most basic principles of Liberty - Peace, Tolerance, individualism, Free Markets, and Limited Government. I enjoy reading the “print” edition much more than the on line version. It is a much better experience and for some reason make me appreciate the level of writing even more. Maybe it’s an age thing! One of the best papers in the US. Thorough reporting on politics and current events. Also like the health and food weekly sections. Keep it up and thanks. Easy to use. Easy to go from one page to the next and one section to the next. Easy to email articles to friends!! Re: Electronic Print Subscription This app is fast and intuitive. I upgraded from the electronic version to the electronic print subscription. On my iPad and iPhone: Read the headlines, select an article of interest and the article is enlarged and displayed. Very easy to move back and forth through the paper. Hyperlinks are included to previously published articles which relate to the one you’re reading. Kudos to the software and content development teams!! This causes pages to zoom out and turn when I’m simply trying to pan the page. Worked better before this recent (2-3 weeks?) change. I do not like this new interface. Other aspects are good, such as content and loading time. Online sample has such low resolution, you can only read titles. Seamlessly switch quickly between the familiar newspaper print view and the interactive video and graphics strewn digital view. Nothing better! 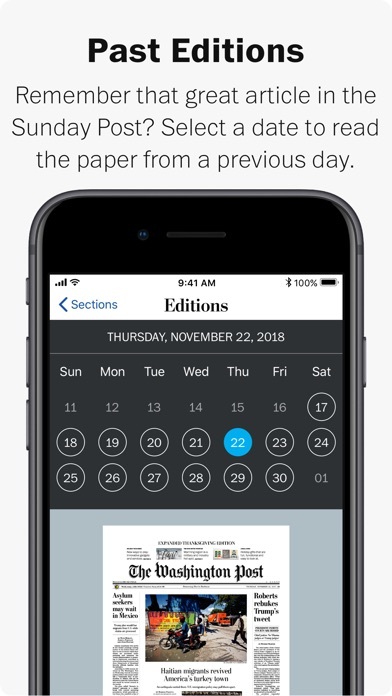 When it works this app provides a great digital version of the paper. Unfortunately it constantly fails to load properly. When it does load, the content frequently responds erratically and unpredictably. They do propagate updates fairly frequently but underlying vulnerabilities remain completely untouched. When they are having problems they do nothing to inform their users (e.g. a brief email or text message that the server is out of commission or there's a problem with data and when to expect resolution.) If you submit a trouble ticket message you get an automated response and then an anodyne 'sorry, we're having problems, try later' message. Needless to say there's never any refund of subscription fees when you can't read the day's paper until days later. Just moved from paper from digital and the experience has been great. I’m an Army Brat, 68 years old, who grew up with the Post. Until I find a way to get it in print (on broadsheet paper!) in Duxbury, MA, the app will keep me in touch, out of the darkness, and chuckling at the best comics section on earth! Love the ease of use and the ability to cite and share. Also, saving trees. Sometimes app shows full section loaded, but some pages are still blank. I like the app but it’s buggy. Couldn’t find any way to report bug. The best thing about the “Real Post” print edition is the article are edited down to fit. The bad thing about the electronic edition is the articles go on and on for too many screens. I am a subscriber TWP daily an Sunday’s an not able to access the digital print using the IOS app advertised by the paper TWP. I can read this like I did the old print version! After doing it 40 years that way it’s what I prefer. Thanks! The New York Times ought to learn from you. W-Post is not yet ready for Apple’s I-Pads! The tech assistance is poor. NYT is emerging as a more tech-savvy on-line paper even for Washington DC & MD readers. The journalism and coverage is very good, but I have been reading the publication on an iPad and an iPhone and find that functions such as page turning and zooming frequently go awry on both platforms. Pages may turn when I intend to zoom in, a section often closes when I mean to turn a page, or the fuller version of an article opens when I’m merely trying to scroll within the print edition. Most frustrating is that often, when I am scrolling within an article, the app interprets intention to scroll as a command to zoom out; thus, I constantly find myself having to resize the text, which is quite annoying and distracting. Isn’t there a way to make these features behave more deliberately?